Rob and Betty opened Schoolhouse Ice Cream & Yogurt in Burlington, Massachusetts in 2003. They knew they wanted to go into business for themselves but weren’t sure what direction to go. 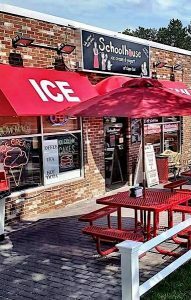 After heavy thought and advice from Rob’s Mother, owner of an ice cream shop in Harwich Port, Cape Cod, they figured everyone loves ice cream, especially in New England; so why not offer a superior product that everyone can enjoy and afford? Now the question remaining was, how can they standout from the competition and which town to open up shop in? By making their own homemade ice cream from 16% butterfat (super premium quality) and using ingredients that are the highest quality available, such as their cocoa powder from Holland and their nuts from California, they knew they had most of the competition beat since only about 12% of ice cream shops make their own ice cream. When it came to choosing Burlington, it was just good timing and familiarity with the area; both Rob & Betty grew up in the next town over, Bedford, MA. Since opening shop in Sept. 2003, Rob & Betty have arrived at the conclusion that if you offer a superior product at a fair price, have happy help and give back to the community, good things will happen. Come by and try out our Homemade Ice Cream, Soups and Sandwiches. If you love super premium ice cream and fresh food, you’ll love our entire menu!